If you are a fan of apple pie and french toast, you will go nuts over my apple pie french toast casserole. 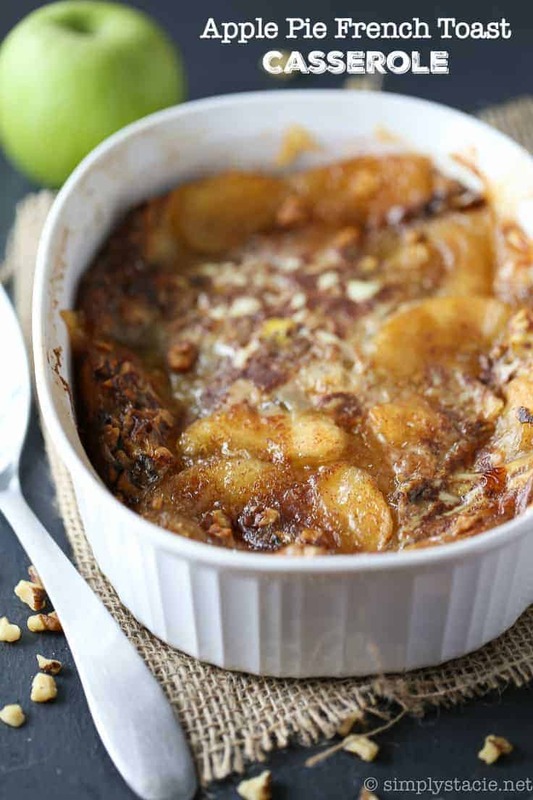 It is like apple pie, and french toast collided to make an irresistible breakfast casserole. Tender raisin bread that is paired with apple pie filling, and warm spices, for the ultimate french toast casserole. I’ve been on a sweet breakfast casserole kick these days. They are just so easy! Plus, I’m craving comfort food this time of year, and I would certainly classify this recipe as comfort food supreme. I so wish there was a scratch and sniff feature. The smell that flows through your home as this glorious french toast casserole bakes is phenomenal. Biting into tender french toast that has real apple pieces throughout is genuinely a dream come true. This recipe came about when I had a can of apple pie filling in my pantry and some raisin bread that was nearing the expiration date. I knew I had to come up with something, or else that lone ranger can of apple pie filling would get devoured by the spoonful. Don’t judge. I am so glad I created this recipe because now I make it for holidays mornings, brunches, and of course, the occasional Saturday or Sunday morning breakfast. The beauty of a french toast casserole is it is magnificent for serving a crowd. You have minimal prep that is required and then toss in the oven to let it bake up. No operating the stove making an abundance of french toast that will feed your family and friends. I am the casserole queen around the holidays. Minimal prep and then I can sit and spend time with my family instead of cooking at the stove for an extended period. I find that using simple ingredients and my handy canned apple pie filling helps me tremendously on prepping. Within no time you can have this french toast in the oven. You can never go wrong with a breakfast casserole in my opinion. Stale Bread | Try to reach for a bread that is a bit stale. With your bread being stale it will help to soak up the custard for that sought after texture. If you use fresh bread, it can lean on the mushy side. One tip I do is set the bread out on the counter the night before to allow it to try up some. If you don’t have overnight to wait, toss your bread in a 200-degree oven, and check every 5 minutes until it begins to dry out. You want it to start to dry out, but not harden up like a crouton. Milk | I opt for whole milk when I make french toast. I find that it will help give the custard a creamier texture once it bakes up. Using a skim milk can cut out some fat, but it does slightly affect how creamy your custard filling will be in the apple french toast casserole. 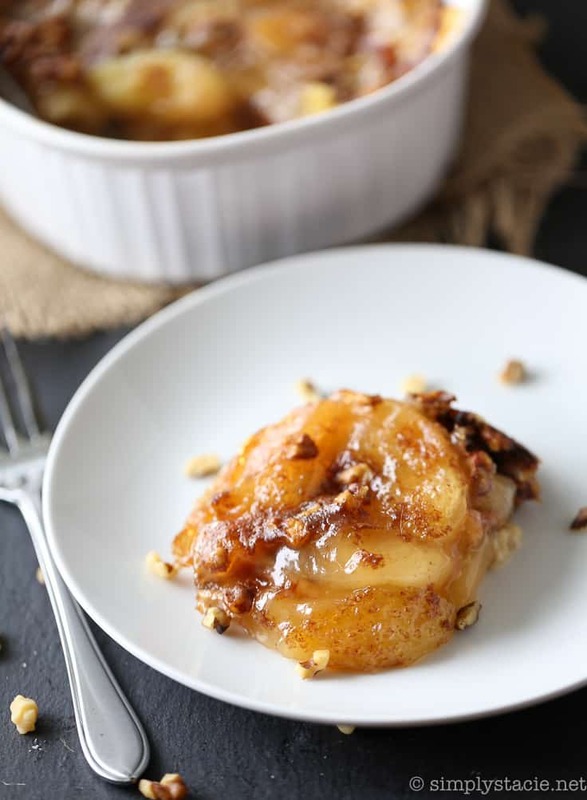 Resist The Maple Syrup | Before you drizzle on your favorite maple syrup, try this apple french toast casserole alone. The reason I say this is because of the raisin bread next to the apple pie filling, you will find this is a pretty sweet casserole as is. Our family prefers to eat it without anything added to it. 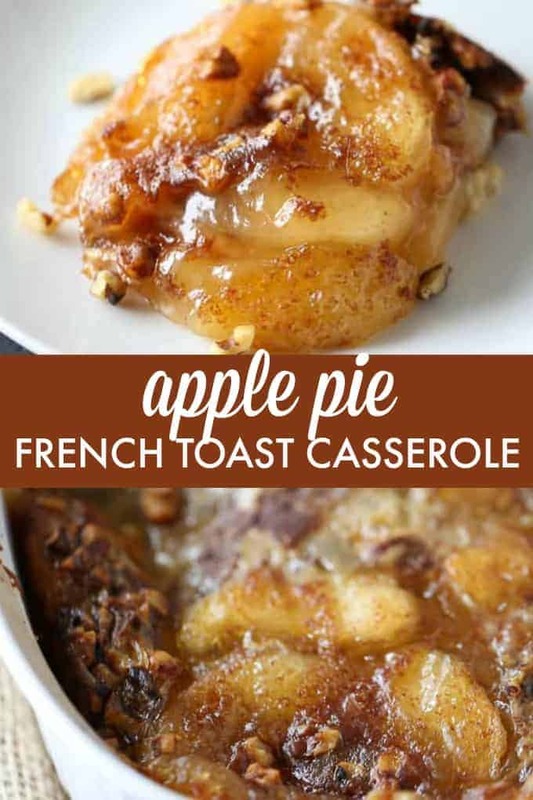 Just take your cooled apple pie french toast casserole and cover with aluminum foil or place in a freezer friendly container and toss in freezer. When you are ready to eat, thaw in the fridge overnight. Cover with foil and bake in a 350-degree oven for 20 minutes or until you find it is warmed all the way through. Yes! You do not have to use raisin bread if you don’t want. I love the flavor pairing, but if you don’t have any on hand, or are not a fan of raisins that is okay. Reach for a sturdy loaf of bread, over a basic sandwich bread. You don’t want a bread that is super soft, as it will become mush in this recipe. A simple apple pie french toast casserole that can win over any family or crowd. Pair with a bowl of fruit, sausage or bacon, or eat alone. You and your family will enjoy this easy breakfast casserole. I know it is a popular one for anyone that has tried it over the years. 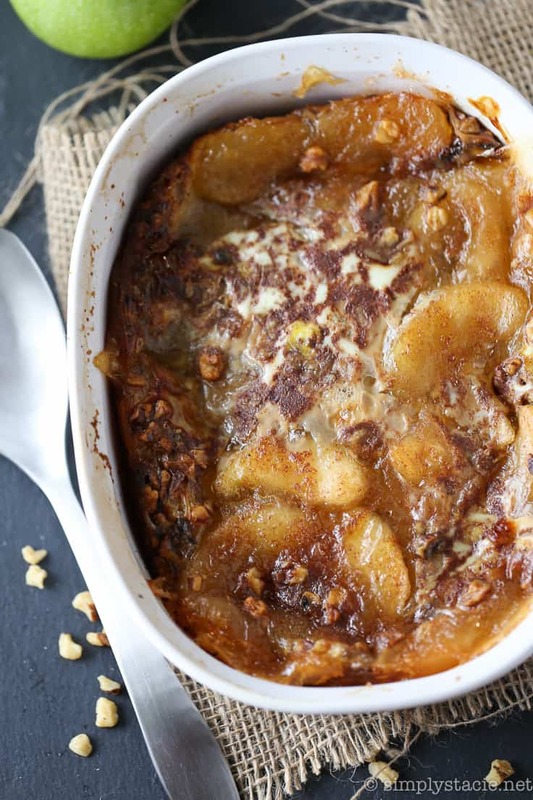 Have you tried an apple pie french toast casserole before? Preheat oven to 350F. Spray a 1.5 quart casserole dish with cooking spray. I used my Corningware casserole dish. Rip up raisin bread into bite sized pieces and spread out evenly on the bottom of the casserole dish. Spread apple pie filling evenly over top of the raisin bread pieces. In a large mixing bowl, whisk together milk, eggs, nutmeg, salt, allspice and vanilla extract. Pour over top of apple pie filling. In a small bowl, stir together brown sugar, walnuts and cinnamon. Sprinkle over top the egg mixture. Cover. Bake for 30 minutes, covered. Then remove cover and bake for an additional 30 minutes or until egg mixture is set. Serve hot. Join the #Nuts4Peanuts Twitter Chat on November 5th! 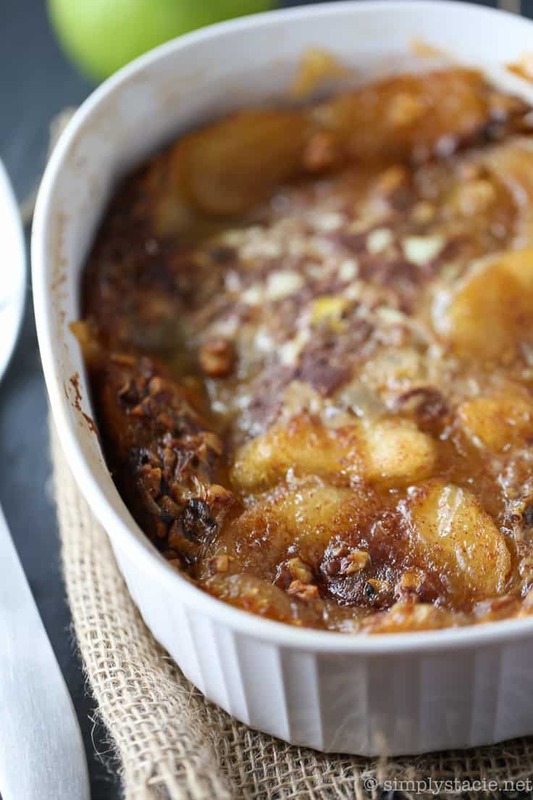 The Apple Pie French Toast Casserole is one that I would love to try for Fall. It is such a pretty recipe and I love french toast. I pinned to Pinterest to try later! Thanks so much for another awesome giveaway!! I’d love to make this! Yum! I might make this for Christmas morning too! I am sure glad I don’t live at your house I would probably weigh 500lbs. but then if I did I would be eating all your wonderful dishes, all your recipes look so good and so easy to make, I think I will try this one with fresh apples, I have some that need to be used up, so I will make them into a pie filling first, this is going to be a great dish for Sunday morning when my granddaughter wakes up, yummmm!!! This is perfect for many occasions! This looks so good! I’m definately gonna have to try this one! The recipe looks simple enough for me to make this coming weekend for our family brunch on Sunday. Mmmmmm … good enough for breakfast or dessert! I love all your recipes, I want to try them all!! This looks amazing! Definitely pinning it. Found you over at Beth’s link party! This looks delicious and I want to try it this weekend. I know my family will love it. We love apple pie. Everything you make always looks so delicious. I must be hungry. Breakfast is my favorite time of day especially when we get to eat a big breakfast. YUM! This french toast casserole looks so good. Mmmm, this sounds really good!! Thanks for sharing on think tank Thursdays. It’s been far too long since I’ve had French toast, but this is going to change that soon! I love that you used raisin bread here – makes it all the more comforting. This is great for a leisurely weekend breakfast and also would be perfect at the holidays. YUM! Hello, wonderful. Where has this casserole been all my life? Omg yum! I love casseroles for breakfast! Hi Stacie…wow does this look DELISH! I have a picky eater 16-year old who would really love me if I made this for his breakfast tomorrow! Don’t have the apple pie filling, but have apples and everything else, so think it’s a go! Can’t wait to give it a whirl! Just pinned this awesome dish, we will love having this for breakfast. Thanks so much for sharing with Full Plate Thursday and have a great week! Sounds like a great recipe for fall. Thanks for linking up with us for Friday Favorites. I’m featuring you this week. This looks so good! I would love to try this Christmas morning. This would be a great dessert for any day of the week,thanks for the recipe ! I love this recipe. I think it would make a tasty supper dish as well. I will save it to my favorites but I think i can remember it as well. it looks so appetizing. Thank you for this recipe. This looks so tasty! And now coming into apple season, I’d love to make this. It would make a nice dish to bring to a get together, too. Oh my word, I would eat this for dessert first, then breakfast!!!! I am going to make this for sure! Thank you! Hi! 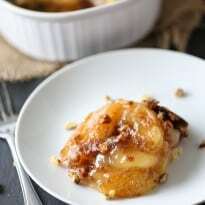 I saw a video of a peach breakfast dish that looked very similiar to this apple dish. I have looked but cannot find the recipe to the peach dish. Can you help?! Thanks! This looks delicious! Do you think it would work to bake in little ramekins? I have ramekins that are so cute and I hardly ever find a way to use them. What is your thinking on this? Would I need to adapt bake time?